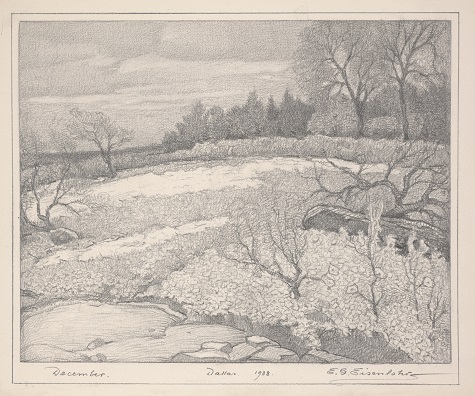 This drawing of a Texas meadow in December by Edward Gustav Eisenlohr from the DMA’s collection of early Texas art seems simple in its portrayal, yet subtle details add texture and depth to the page. Notice the hatching on the rock formation in the foreground or the care given to the hundreds of individual leaves and petals throughout—a departure from the idea of a Texas landscape as an endless desert or barren prairie. The temperature in Dallas in December 1938 averaged 48 degrees, but interestingly a record high of 84˚ was set on December 10 of that year. Therefore, despite being a winter month, the white patches to the left are likely not snow. Eisenlohr often represented bare spots in the ground, a common occurrence on the prairie, with colorless patches. Eisenlohr was a Dallas painter, printmaker, and teacher. Born in Cincinnati, Ohio, in 1872 of German descent, he died in Dallas in 1961 and is buried in Oak Cliff. Eisenlohr initially moved to Dallas as a child with his family, and later the area would become his inspiration and artistic base. He studied in the early 1900s with Texas art legends Robert J. Onderdonk and Frank Reaugh, which included lessons during outdoor trips. Eisenlohr would continue to make sketching trips to sites all over Dallas, so the above work was most likely done en plein air, or created outside from life. He was involved in establishing the Dallas Art Association, forerunner of the Dallas Museum of Arts, in 1903, which, as you know, became the DMA. Rae Pleasant is the Research Associate for Early Texas Art at the DMA.